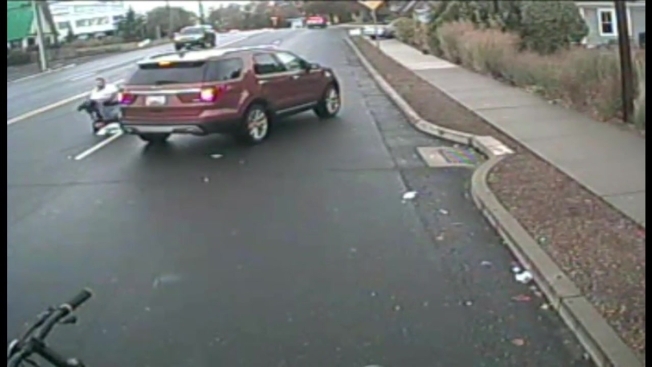 Police are looking for a man who briefly hopped out of his car to kick a man in the face amid a brutal, caught-on-camera brawl between two men in the middle of a busy Connecticut roadway earlier this week. Two men have already been arrested in the brawl on Post Road in Westport about 9 a.m. on Tuesday, but police said the violence actually began well before a driver with a dashboard camera happened on the men pummeling one another in the four-lane highway. Police in neighboring Derby said one of the men later seen in the video showed up at the other’s home and allegedly hit him with a hammer. When the hammer-wielding suspect left, the homeowner drove after him into Westport. The two men then crashed their vehicles, blocking two lanes. That’s when the dash cam video picks up. By the time the driver happens on the scene, one of the two men had hopped out of a van, which rolled toward oncoming traffic. That man takes off running down the sidewalk, and the other man’s car speeds over the curb and onto the sidewalk in an apparent attempt to hit his foe. The car then crashed into bushes, and the two men can be seen running back onto the road. The man who was in the van trips to the ground, and the other man catches yup and drags him a short distance. That’s when the third man, in a burnt-orange Ford Explorer, pulls up. The SUV nearly hits the two men, and the driver of the vehicle gets out and kicks the man who was in the van and looks down as the man who was in the car wails on the other man. The third man then hops back in his car and speeds down the road. After the third man leaves, the man in the car kicks the man in the van several more times and appears to yell something. That’s when the man in the van, who was previously on the ground with his arms covering his head, makes a run for it. The two men then run out of the dash cam frame. Westport police quickly arrived and cuffed both men, identified as Fernando Morales, 41, of Derby; and Rafael Valle, 34, of Bridgeport. Morales was charged with assault, second-degree assault and reckless endangerment; Valle was charged with reckless endangerment. Both men have since been released on $5,000 bond and are due in court in November. Attorney information for the men wasn’t immediately available. If you know anything about the third man involved in the brawl, call Westport police at 203-341-6000.